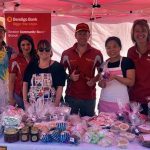 One of Australia’s premier markets, for almost 12 years Slow Food Melbourne Farmers’ Market has been bringing Victoria’s best produce to the community. We’ve got your eating needs covered with up to 80 stalls showcasing organic, biodynamic and spray-free seasonal fruit, vegetables, nuts, grains, meat, poultry, dairy, artisanal smallgoods and pantry staples. Accredited by the Victorian Farmers’ Markets Association, you can be sure that all our stallholders grow and make their own products. Rain, hail or shine, every 4th Saturday of the month at Spotswood Kingsville RSL from Feb 2019. Plastic-free and eradicating waste at every opportunity.